This pristine beach is located in Vietnam’s third largest city and arguably the most rapidly developing city in the country. With a 32 kilometer stretch of pristine white sands, laced with resorts, bars restaurants and other forms of entertainment, My Khe Beach attracts tens of thousands of both local and international visitors each year. It is a great place for anything from relaxing to even snorkeling or jet-skiing. It is also located near the famous town of Hoi An, just 40 minutes away by car. Best tips: My Khe has buggy-type shuttle taxis that operate most of the year round. They are a fun and cheap alternative to taking a taxi! A beautiful beach containing many highly rated coastal resorts, Mui Ne Beach is like no other. This due to it being in the driest region of SE Asia, making it perfect for visitors. Even in the rainy season, Mui Ne sees very little rain in comparison to other regions in the area. The beach itself, boasts golden sands and blue skies. Surrounded with palm trees giving it that desired tropical vibe, Mui Ne Beach is also well known for its wind and kite-surfing. Best tips: For thrill-seekers or just those feeling adventurous, there is 4×4 quad biking available in Mui Ne! Known for its picturesque, long stretch of beach that has a whole city located just across the road, Nha Trang has been a staple tourist destination for some time now. Nha Trang is a coastal city which is considered to be world class. Some of the reasons for this are location – it is very easy to travel to the beach from most hotels; it only experiences 4 months of rainy season; it offers a range of water sports that make it unique, including being famous for diving lovers! Furthermore, Nha Trang also has Vinpearl Island, which is a resort island with a water park, amusement park and luxurious hotel. A short boat ride across the beach will land you there and it is perfect for everyone from solo-travelers to families for a bit of fun. Best tips: If you do happen to visit Nha Trang in the rainier season, there are plenty of wet weather itinerary tours available! This unique beach lies on the west coats of Phu Quoc Island and is approximately 20 kilometers long. It’s practically deserted beaches are ideal for lovers of sunbathing and swimming, the ocean breeze rolls in gently from the ocean in a different way due to it’s island location. Here you can relax and enjoy a coconut (fresh from the trees located on the island) and bask in the picturesque sunset Long Beach has to offer. Tips: The beach is separated into North and South Long Beach. North Long Beach is older and more densely populated, where you’ll find all the necessities in terms of accommodation, restaurants and food. South Long Beach is newer and upscale, where you can also find a few Pearl Farms and temples of worship. A lesser known beach in Vietnam, due to the city of Hue’s smaller population, Thuan An Beach is often overlooked and equally underrated. In terms of breath-taking landscape, Thuan An won’t give you the same shock value as another beach such as My Khe Beach in Danang. That being said however, Thuan An makes up for with it’s lively vibe and friendly locals, having cheap seafood restaurants and cafes as far as the eye can see! Another charming factor about Thuan An is the ability to feel tucked away, hiding from the world. Some of the best seafood restaurants are down multiple winding paths, which open up to a small nook of ocean that is jumping with energy and locals having fun! Tips: Thuan An Beach only has 2 main resorts located in it, whereas the majority of travelers visiting Hue will stay downtown, about 15 minute taxi ride away. Although artificial, Tuan Chau beach has some perks that other beaches don’t have. Just 3 kilometers in length, Tuan Chau is purely designed for the happiness of tourists. For those wanting all forms of entertainment to those just wanting to relax, it has it all. Especially notable here are seal and dolphin shows, as well as a circus. Additionally, it ties in very well with travelers partaking in Halong Bay Cruises, located just 8 kilometers from downtown Halong. As for the beach itself, it ticks all of the boxes in terms of cleanliness and landscape. Tips: This is a very modern, developed style beach. For those wanting a more peaceful and natural beach, you can afford to skip this Tuan Chau. Each traveler to their own! Located just by the famous ancient town of Hoi An, Cua Dai is a basic yet beautiful beach that unfortunately experienced some erosion issues in recent years. Despite this, it still remains popular with holiday makers due to the fact that it is laden with sun beds, umbrellas and beach-side restaurants. If you travel slightly further up north, toward Ang Bang Beach, you can find a fairly empty stretch of white sand that has an attractive tranquility to it – a good alternative from the crowds. Tips: Avoid the areas with heavy construction and sandbags to help with the beach erosion. The rest of the area along this part of the coast is truly a treasure! Please note: the above information is according to personal preference. 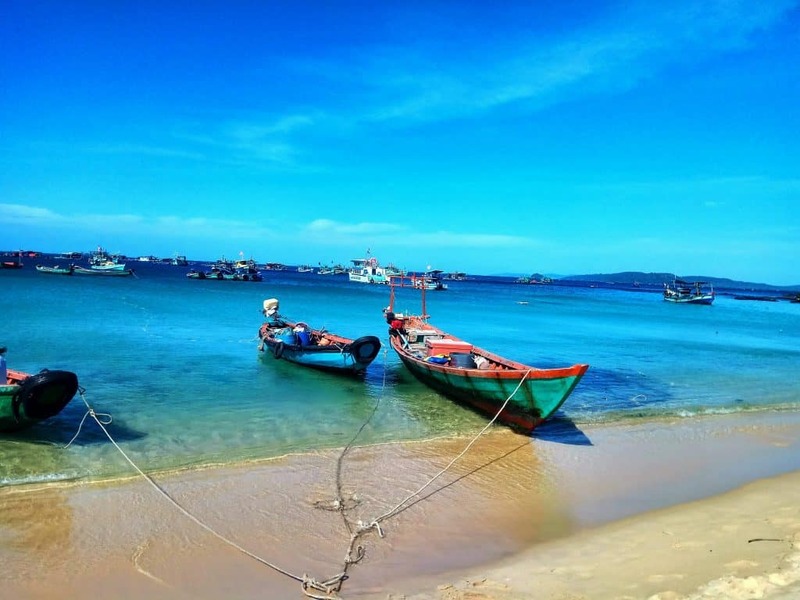 There are many other fantastic beaches in Vietnam, so don’t be afraid to look past this article depending on where you are traveling!